Buckle up guys, today I have some really cool things to show you! First of all, I would like to share a new shop with you - Ninja Polish! Okay, on to the polish! NerdLacquer created the Ninja Trio, a set exclusive to the Ninja Polish store, and I have one of them to show you today. Information about the other two, Eight Gates and Acid of One Thousand Fangs, can be found on the shop page. Smoke Dragon is a matte deep charcoal with silver, purple and black microglitter, gunmetal medium and large hexagonal glitter, and large black hex glitter. A mystic beauty in its native matte form, and equally magical with a gloss top coat...which will bring out an extra bit of violet shimmer. YOU HEAR THAT!? BLACK GLITTER! All photos show two coats with topcoat -- sorry I'm not sorry, I just love that even look and the shine! :) These first four pics are in direct lamp lighting to mimic sunlight. And here are some photos of it in diffused lamp lighting -- this is closer to what it looks like indoors. Finally, I'm no Fashion Polish, but I tried to get a nice macro of this for you guys because it's just so cool. P.S. My pointer nail isn't way shorter, it's just tilted upwards! Smoke Dragon was super easy to apply and had nice, even coverage. The only thing I struggled with a little bit was getting the bigger glitter pieces out to show you guys. It did dry semi-matte, but I think topcoat is the only way to go with this, as the purple shimmer is practically invisible otherwise. I would also like to note that this polish has a lovely green shimmer in certain lighting, but no matter what I tried I could not get it to show up in pictures like I wanted it to. You can see glimpses of it at times, but it is much more visible than my pictures would lead you to believe. 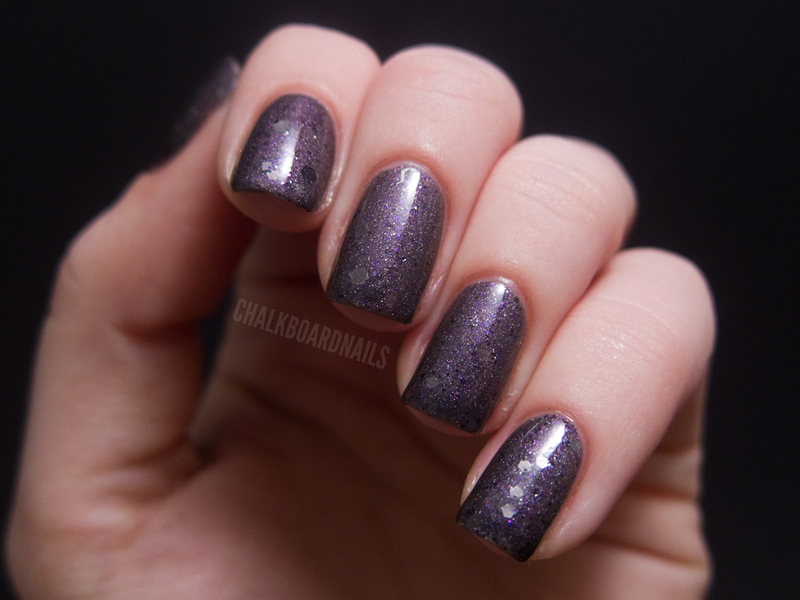 NerdLacquer Smoke Dragon sells for $10 on the Ninja Polish website. It is currently sold out (whoa) but you can sign up to be notified when it is restocked on the product listing page. This product was sent to me for review. That is so pretty! I'm definitely bookmarking the ninja polish site. Thanks for the heads up! LOVE LOVE LOVE this! This is on my priority after no by wish list! That is all kind of gorgeous. Holy gorgeous! Thats the prettiest polish Ive seen in a long time. Awesome! I am stalking Ninja Polish now...what a great site! This looks very very pretty! Amazing color and how awesome that you get to show off one of her new polishes!! Of course now I will be stalking that site and her on Google+!!! I must say this is a MUST have polish for me, the color the name just perfection. I wonder if the other sites will be getting it to like her etsy store, thinkgeek and llarowe. WOW! Yet another NL polish added to my lemming list! Oh man, I need this polish. Black glitter? You know the way to my heart! This is truly beautiful. Thank you for the swatches, love! This is a gorgeous colour! Hardly anything left at Ninja, but I got some goodies. This is gorgeous, and I will be ordering it for sure. Purple and blue laser tape manicure! My first successful water marble! Elemental Styles - 25 Manganese, Please!